Sengoku Martial Arts members Thomas Dickens, Alfie Haycock, Nicki Harrison, Ty Harrison and Izzie Fleming, who were successful at the British Open. 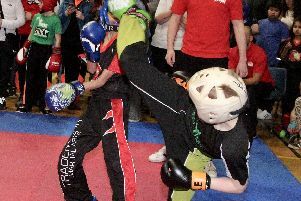 Featherstone martial arts star Thomas Dickens proved he was the best of the best at the weekend. Thomas was part of a team from the Sengoku Martial Arts club that entered the British Open competition in Walsall. The competition attracts entries from all over the country and the team from the Featherstone club brought home an impressive haul of medals. Star of the show was Thomas, who won gold in the Shotokan Kata section and silver in the other styles category, which meant he out performed competitors in their own styles. To achieve this, he has needed to study extra hard and learn moves that are unfamiliar to him in and perform them in a way he is not used to doing. At the end of the competition the gold medal winners from the groups competed in a Best of the Best group with Thomas coming out the winner. The competition is run as a league and the wins at the weekend have put Thomas in pole position to take the overall title in his category in December. Thomas also paired up with instructor Ty Harrison to perform in the pairs section and the duo just got pipped for the gold medal. Sengoku Martial Arts’ other successful medal winners were Alfie Haycock, who took the silver in the under 9s and performed exceptionally well in the age group above, coming out the eventual winner to claim the gold. He also paired up with a senior student, Izzie Fleming, and the pair won silver in the adult and child section. Izzie continued her competition journey by winning a bronze in her group and assistant instructor Nicki Harrison completed the medal haul with a gold in the veterans group and the over 16s group. The Sengoku team also included Jensen McCreavy, who entered his first competition. He did not come out with a medal this time, but did well and only lost by a split decision to a member of the England team. Sengoku Martial Arts is based in Featherstone and offers classes in karate and kickboxing, taking all ages from three. Anyone interested in joining can contact the club via their Facebook page or speak to instructor Ty Harrison on 07539957977.